Fernando Alonso F1 memorabilia – framed and ready for display. The frame has a domed front to accommodate the signed baseball cap. From Silverstone to Suzuka, Monaco to Monza, wherever your favourite F1 battles have unfolded, find the sports memorabilia to take you there. Find the sporting collectibles you love with Sports and Music Legends, like this Fernando Alonso memorabilia. 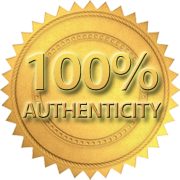 We’re passionate about ensuring your signed F1 memorabilia is 100% authentic.